You know what is nice? Waking up to hear nothing but a few birds chirping and the wind rustling through the few trees that are around; not a single car driving down the dirt roads to make noise. Some days I wish I could escape to a place like that just to get away form the busy hustle and bustle in my Greensburg. Saturday was going to be a busy Saturday. I woke up around 8 and Jan had made a delicious breakfast, which she didn’t have to do at all! I got ready to go and we were on our way! The week I went their county fair was about to start and I got to see part of the 4-H horse show. 4-H in Kiowa County KS is 100% different from in Westmoreland County PA. First off the horses were different. These are work horses with a completely different muscle tone than horses in my area. They were muscular and moved with a full range of motion. Westmoreland County 4-H is pretty well-known for the “show horse” look. Lots of the pleasure horses have their noses to the ground and have what they call a “peanut roller” look. Trainers are often seen riding the 4-H members horse to “get the kinks out” before the show ring. Its your horse, ride it yourself and get the kinks out yourself. This is how 4-H is in Westmoreland County and it’s disgusting. 4-H should be about learning by doing. Not watching a trainer train your horse or your mom and dad groom/tack up YOUR horse while you sit around or socialize. In the 10 years I was a part of 4-H, the program has only gotten worse and worse. Yes, 4-H granted me a scholarship and I am very grateful for it but that still doesn’t mean I like what is going on there. 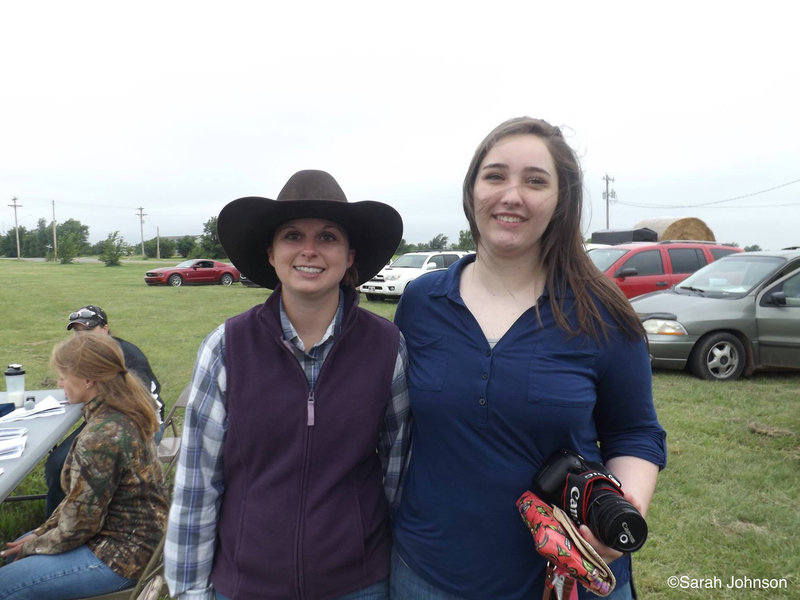 When I saw Kiowa County’s 4-H horse show that Saturday morning, my faith in 4-H was restored. These kids had done all of the work themselves. Sure, their showmanship patterns weren’t world show quality but they did it all themselves and that was all that mattered. Those kids won those ribbons for all the right reasons! You’ll have to ignore the fact that my hair was flying around everywhere! Jan got a photo of the judge and I that was judging the 4-H horse show that day. Very nice judge and was perfect for a 4-H show! She knew just the right way to explain to the kids how to take their skills to the next level. A good judge takes the time to talk to the kids. That means they truly watched the riders and how they executed their class patterns. 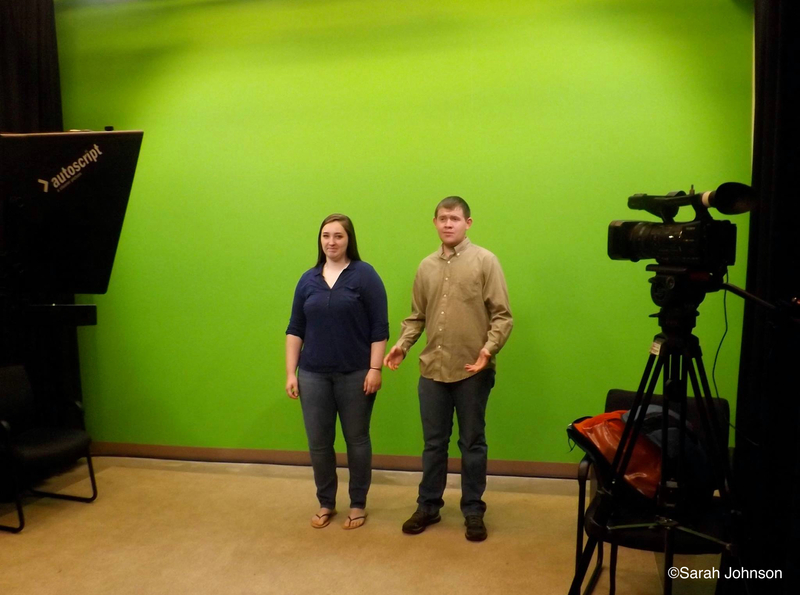 After we stopped by the horse show for a while, we headed over to the Kiowa County Media Center to shoot what Jan called a Spot. A spot is basically just a video or commercial. I never saw the final product of the Spot but I think it turned out pretty good! Now let’s dissect what the media center was. One word = intriguing. I had never been in a TV studio set or a TV studio control room. I felt like a kid in a candy store and just wanted to touch everything. SO MANY BUTTONS!! JD showed up and we both did our parts for the Spot. The Spot was about Rotary and that is pretty much all I remember! Once we finished with the Spot, if I remember correctly, we went and saw the livestock in the barn too. When we went, there was a clinic for the kids to learn how to properly judge animals. I wish I would have had the opportunity to learn this kid of stuff. My county never even taught us how to judge a horse and place it! Jan’s son, Cory, and Gene were practicing for the horseshoe contest later outside of the barn too! Of course they insisted I try throwing a horse shoe during one of their practice rounds! 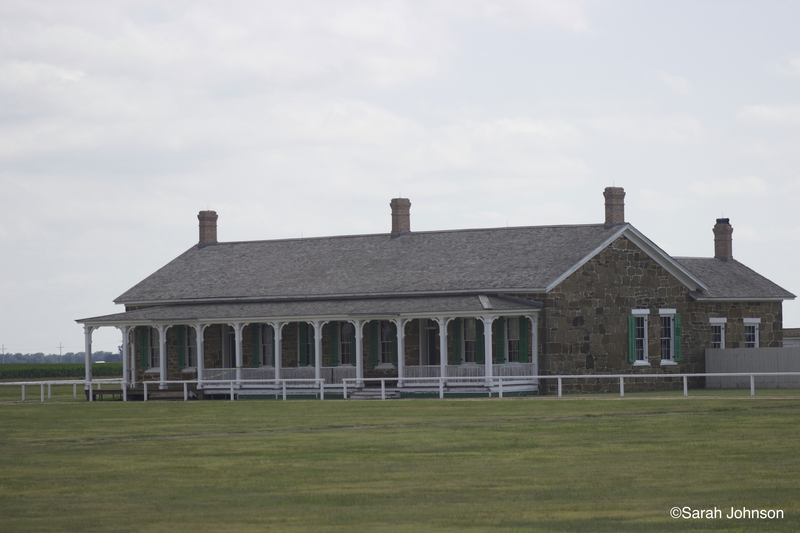 That afternoon, Jan and I took a drive out to Larned, KS; which is where Fort Larned is. I have never been into history much because of every terrible history teachers I had in high school but this really caught my eye; I was really interested in this. 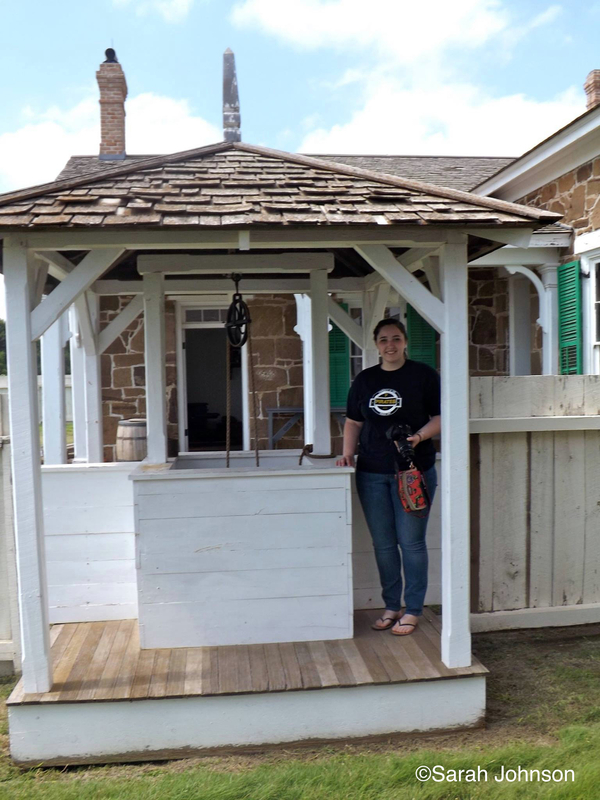 The buildings that you see at the fort are mostly restored and one building was turned into the museum and gift shop. 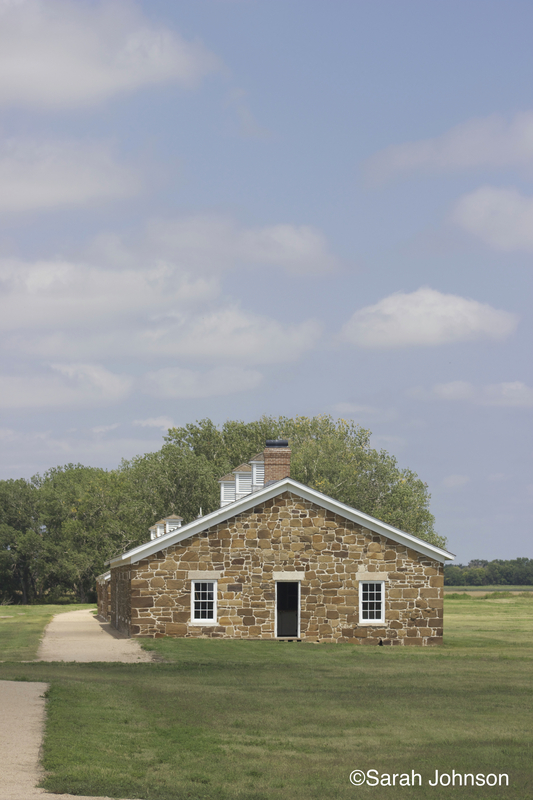 Fort Larned was built in 1859 and was the key post during the Indian wars until 1869. 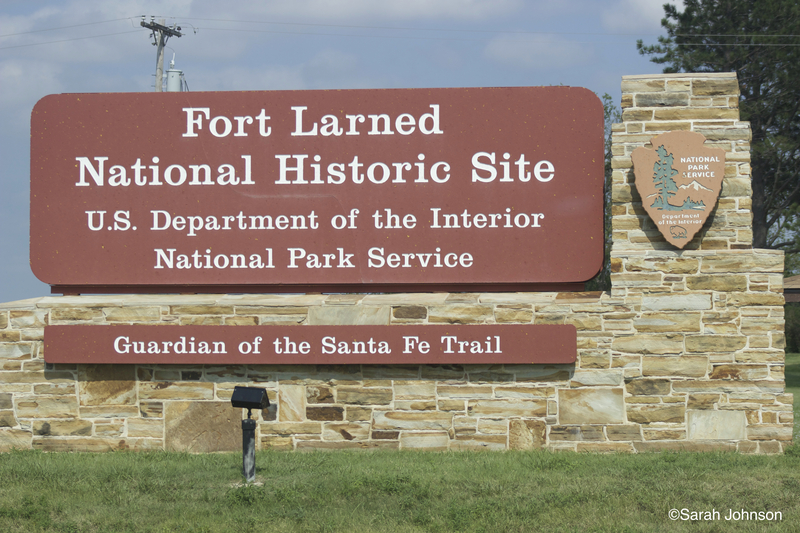 Fort Larned was built to protect the Santa Fe Trail from Indian attacks. Once the railroad started to advance out west then soldiers were needed to protect the railroad workers form attacks. 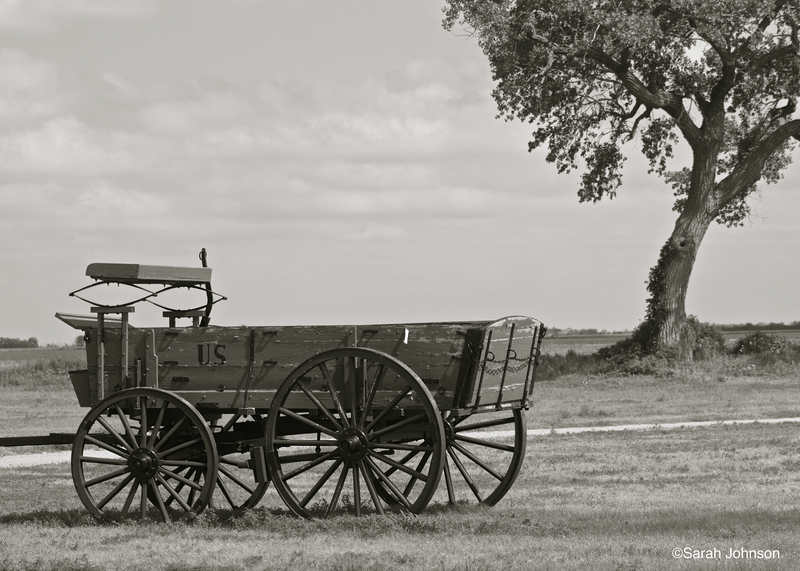 The railroad started to be used even more and there was less and less traffic on the Santa Fe Trail. The first was then abandoned except for a small group of guards left to protect the property. In 1885, the land was turned over to be sold by auction and became private property. The ranger that worked at the museum and gift shop explained to Jan and I that the person that bought the property had lived there as a groundskeeper. When the land was to be turned into a museum and gift shop they went through the buildings to see what was there. They noticed quite a few bunks gone and it turned out the owner had cut up some of the bunk beds and used them as firewood! 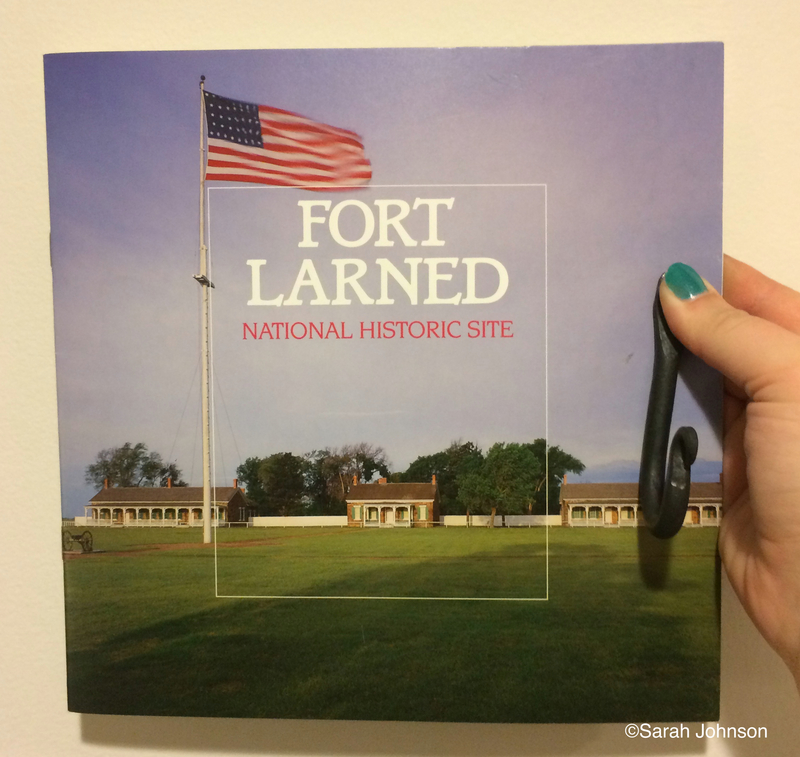 In 1964, Fort Larned officially became Fort Larned National Historic Site. 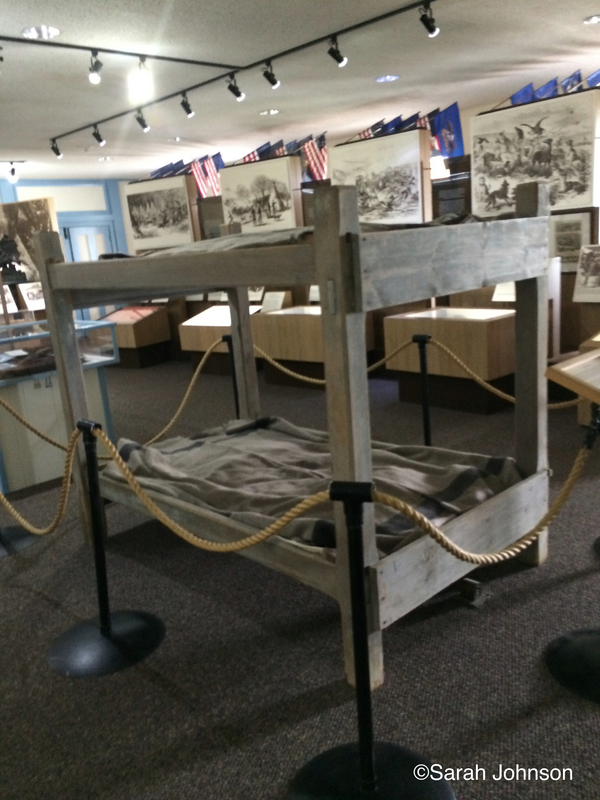 The leftover bunks were then moved into the museum and then a few were shipped to other historic sites in the country. I knew buying the informational booklet would come in handy one day! The hook you see in the photo was given to me by the blacksmith. Jan and I had gotten there and walked around towards the end of the day and he just happened to have one leftover! The workmanship is just pristine on everything that man does! On our way back to Greensburg I got to see crop dusters!! I have never seen a crop duster before and it was super cool to see! Not sure if I would ever want to fly in one though, those pilots get a little crazy! After Fort Larned we went back to the fairgrounds for dinner. What amazed me so much was the fact that everyone was so polite and giving. There were many times when people looked at me and said, “You’re not from here are you?” and of course my answer was always,”No I’m not.” Those people had then welcomed me to town and asked why I was here. Of course all I had to say was Rotary and they were asking a million questions about where I was from! I never met one unpleasant person! 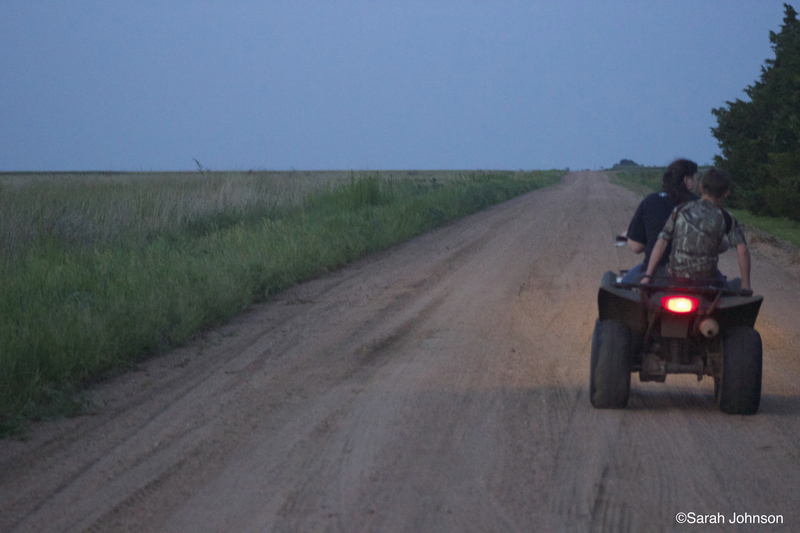 After dinner, Jan and Gene took me out on a drive through the open range land. I saw lots of cattle and what I call Kansas “mountains” on the drive! The open range land has no gates. It’s all open so farmers and ranchers can drive through. To avoid having gates, cattle ranchers and farmers have installed what is called a cattle guard. A cattle guard is usually placed where they cross a fence line. It is a metal grid placed over a ditch to completely cover it. The transverse steel bars or tubes are spaced enough so that if a cow tries to step over it, their legs will go through it. I feel like that may have been one of the hardest things to describe so if you still don’t know what I’m talking about, hop on over to Google and search cattle guards! I had never seen these until I was in the open range land. Where I am from, there isn’t enough farmland/livestock land to have open ranges so this was something new to me! 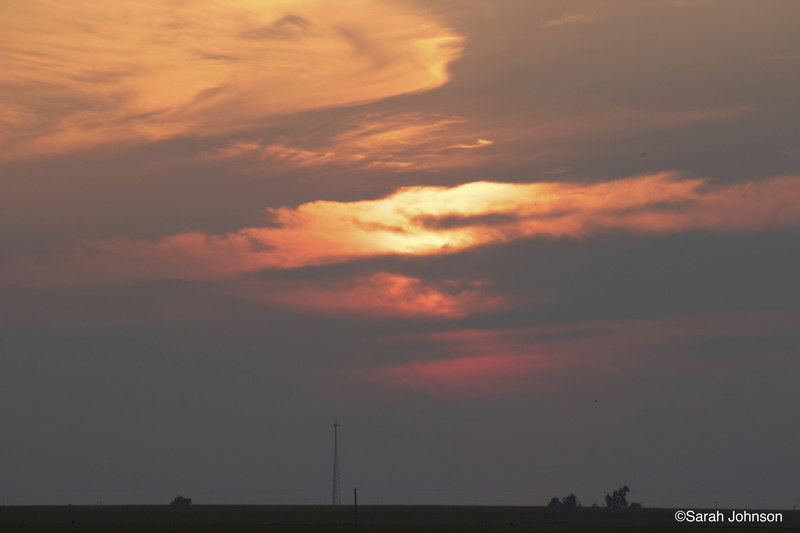 When we got home, I decided to watch the sunset for the first time and take some photos along with it! Gene ended up joining me and I don’t remember what we talked about but I do remember talking about my college plans! That’s all I remember! Their son and grandson, Cory and Coby, ended up stopping by. We all chatted for a bit while the sun was setting. Cory mentioned that Coby was into trap shooting. I have wanted to try trap shooting for a long time and I was a little jealous! I had mentioned that and the fact that I had never shot a gun before. Cory got very excited and said that he had a couple guns in his truck. All of a sudden he was running to his truck and came out with a .38 Special and a .22 shotgun. He showed me how to shoot it and OH MY GOSH, how do people shoot guns?! The revolver was so loud!!! Once Cory showed me it was my turn. I was standing there for a solid five minutes nervous to pull the trigger. I had to mentally think, it won’t be that loud; you can do this. I hopped around with a gun in my hand because I was so nervous as three guys laughed at me! I felt like Sheldon in Big Bang Theory breathing into the paper bag; just a little nervous! I took the safety off, pulled the trigger and the bullet flew off into the open field. Oh hey, did you say something? I CAN’T HEAR YOU because when I pulled the trigger, it wasn’t centered with my body and it pulled to the left so I temporarily lost all hearing in my left ear for about 20 minutes. Call me a wuss but I made Cory hold my ears for the shotgun and it was the quietest pop sound ever. Talk about being embarrassed but HEY, it was worth the laughs because when they have a bad day they can remember watching that silly PA girl hop around with a gun! Somehow we got into the topics of four wheelers/quads after that. Again, that’s something I have never done! So Coby insisted that I lived under a rock (pretty sure I did up until I got there!) and that I had to drive a quad around. So Coby gets one of Gene’s quads out and brings it up. Then all of a sudden I find myself riding a quad with Coby on the back. I WAS LEARNING TO RIDE A QUAD FROM A KID. Don’t be offended if I get his age wrong but I’d say he was 12 or 13 years old. (crossing my fingers that was around his age because I don’t remember!) I was essentially learning from a teenager that in my mind has lived a pretty cool life being surrounded by this kind of stuff! I will say, that boy will grow up to be a fine young gentleman one day because he is truly one of the nicest kids I’ve ever met. He has so much knowledge to everything he does it seems. His parents and grandparents brought him right and they should be so proud of him! After the sunset, Gene and I went back into the house to join Jan. Gene was showing me a bunch of guns that he has and it was super cool! I have never seen guns like that and I was very excited to learn about them. Jan showed me Coby’s 4-H trifold display that he was entering in the fair. She also showed me his photography entries! He is a great photographer and I sure hope he knows it! I was lucky enough to see his display at the fair a few days later too! I also got to watch Minnie run around the house like a crazy cat! It made her ten times more adorable! This was definitely a day to remember! Something that will carry on with me for a long, long time!